THE COMPACT, ULTRA LIGHT MINI CRANE WITH THE FLEXIBLE ARM. 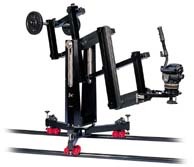 JIX unique flexible arm, which is adjustable in length during shooting, gives an extremely wide range of very controlled movements in all situations. JIX enables you to move the camera straight up and down, left and right, forward and backward. JIX fits directly onto track or dolly platform, and the unique fexible leg system can also be adjusted to fit onto very small track and as a quick dolly set-up for your tripod and low-shot adapter. JIX can also be used without track as a stand-alone unit, with all camera movements in three dimensions from one position.